Haloumi, my second hard cheese, is originally from Cyprus. It is traditionally made with sheep's or goat's milk, but can also be made with cow's milk. The interesting part about Haloumi is that you press the cheese for several hours, and then essentially pasteurize the cheese in its own whey. After pressing into a hard block, I cut the wheel into four wedges, then cooked them in the whey at 190 degrees for an hour. After giving it a couple of hours to dry, it is then soaked in a brine solution (two pounds salt per gallon of water... insanely salty!). I added a little bit of the whey back into the brine, to help add some flavor, and then started aging the cheese. 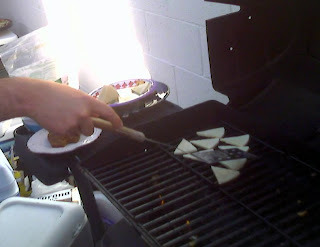 Haloumi has a very high melting point, so it's great for cooking at high temperatures (perhaps Saganaki?). It's best sliced thin and then pan-fried... Or just thrown on the grill! I don't really have enough space to give you the "complete process" for Haloumi here... I'd definitely recommend you pick up a copy of Ricki Carroll's book. It's got the recipe as well as the details of each step. One additional note: I recently tried some Haloumi in a restaurant, and found it wasn't nearly as salty as the one I had made. So if you do follow Ricki's recipe, be wary of adding too much salt! (Maybe don't make the Brine quite as strong).